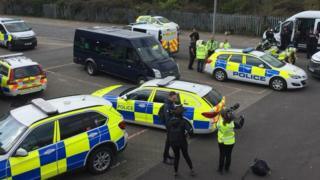 The 29 people found in the back of a van stopped by police on the M5 are thought to be Vietnamese, officials say. Devon and Cornwall Police arrested four men aged 55 to 72 after being called to Newlyn, Cornwall, on Friday after people were seen getting into the back of a van from a boat. The four men arrested on suspicion of immigration and modern slavery offences, including human trafficking, were a 72-year-old and a 55-year-old from Lancashire and a 63-year-old and a 62-year-old from Kent. A spokesman for Devon Children and Families Partnership said agencies in Devon and Cornwall were supporting the group and arrangements for temporary accommodation will be made if any of the individuals are under 18 years of age, pending further decisions about their status. A British Red Cross spokesperson added: "Our volunteers are continuing to support a number of people who are the alleged victims of human trafficking. "We are providing them with practical and emotional support at a rest centre while the police conduct their investigations. "Our volunteers are neutral and impartial and are concerned only with the welfare of the people affected."